The Snohomish County government has started early scoping for the seven stations on the Everett Link Extension, which is scheduled to open in 2036. An online open house and survey is open until the end of the month to collect feedback on potential station locations near the current Ash Way and Mariner park and rides in northern Lynnwood and southern Everett. The survey will inform the county’s recommendations to Sound Transit when it begins the official scoping process in 2020. The open house follows an earlier survey that was conducted over the summer and gathered general suggestions on an interactive map, similar to those used recently for ST3 projects in Seattle and Tacoma. Of 114 map comments collected, the top-ranking answers wished to address affordable housing, at-grade crossings, public amenities, and alternate routes over I-5 for cyclists, pedestrians, and buses to and from the stations. A set of three concepts for each station were generated by the county based on the suggestions and criteria accounting for design constraints, future connections to the Swift Green and Orange lines, bicycle and pedestrian accessibility, and TOD opportunities. The TOD scoring assumes that mixed-use development of buildings ranging from three to ten stories would be programmed within the half-mile walkshed of each potential station site. For Mariner Station, where the shelters for the Swift Green Line have already been set up and painted in the brand’s colors, the three options are all within a block of each other on the northwest side of the park-and-ride lot. The representative project description for Everett Link also lists a 550-space parking garage at Mariner, which could be built on top of the current park-and-ride lot. Option A would place the station on 128th Street Southwest at 8th Avenue West, the furthest walk from the current park-and-ride and bus bays. It could include a better Swift transfer if the current station is relocated, and was rated with good potential for TOD while also serving the existing commercial strip and several nearby apartment complexes. Option B would put the station right over the intersection of 128th Street Southwest and 4th Avenue West, one block north of the bus bays and adjacent to the current Swift station. It would require a wider turn for trains, running into potential right-of-way issues, but scores high for TOD and access to the Interurban Trail. Option C would also use a diagonal station, but take a shallower turn across the current shopping center immediately west of the bus bays. It would have a further walk from Swift, but rates high on TOD potential and its simple design. Ash Way Station would not require a new parking garage under the representative project description, but comes with major design hurdles due to its location on the narrow strip between I-5 and the Swamp Creek wetland area. To the north of the current park-and-ride is a complex of a half-dozen apartment buildings and townhouses that were opened in the mid-2010s and house hundreds of people. Option A would place the station over 164th Street Southwest at the Ash Way intersection, with most of the immediate walkshed cut off by the I-5 interchange and the wetlands at the bottom of a major hill. 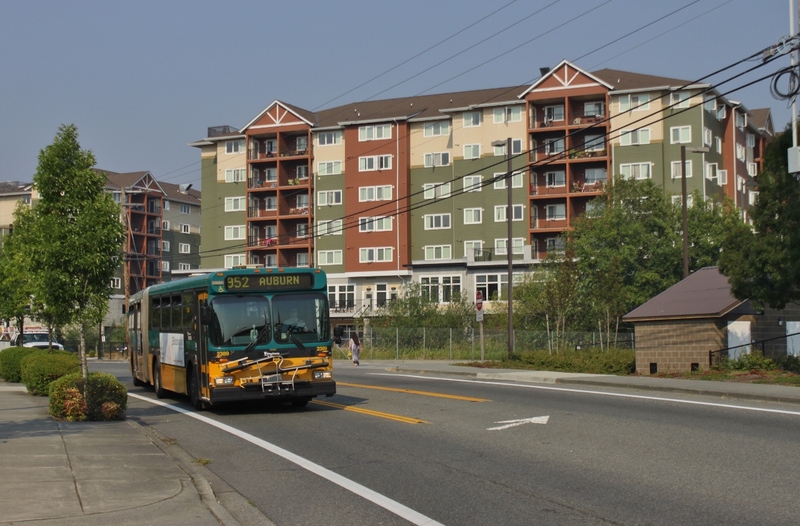 It rates low on TOD opportunities but has favorable access to the Swift Orange Line, which would run along 164th and connect the station to Mill Creek, Alderwood Mall, and Edmonds. Option B would bisect the current park-and-ride lot, placing the platforms just south of the bus bays and have few complications for track design. It would, however, have poor connections to Swift and nearby pedestrian facilities while also limiting future TOD. For this option, Swift buses would have to endure four traffic signals and a ride around the bus loop, which would cause significant delays to serve potential transfers from Link. Option C would be a radical departure from the other two options, placing the Ash Way Station on the east side of I-5 at the intersection of 164th Street Southwest and 13th Avenue West and completely disassociating itself from the park-and-ride and the namesake street. In fact, it would be closer to Martha Lake (which would serve as a better station name) and have better connectivity from downtown Mill Creek, which would only be 1.5 miles away. The Option C station would also have better connections to the Swift Orange Line and plenty of TOD potential that is further from the I-5 off-ramps and free of any environmentally sensitive areas. The station and a potential relocation of the bus bays would require demolition of one or more major retailers in the area, including a Walmart, and would require two major crossings of Interstate 5, which would increase project costs and engineering complexities. Thinking long-term, it’s obvious that the station options furthest removed from Interstate 5 and aligned with Swift would be the best choice, regardless of cost and complexity. The survey will run until November 30 and would be followed up with subarea planning for the recommended station options chosen by Sound Transit sometime in the next few years. It’s hard to identify preferences without seeing how conceptual access to the stations will be affected. Bus routes, drop-off areas and pedestrian connections can be adjusted to make a site or better or worse choice. I’d much rather see a general budget assumption set for each site, and see how access would be provided given that budget. That would help lots! It’s pretty much assumed that the Mariner bus bays would stay put, along with Ash Way’s for Options A and B. With Option C, I’d hope that the entire transit center is moved under the station and rebuilt in a way that prioritizes east-west movement, since I-5 will be less of a factor. The representative alignment is the budget assumption, so the issue is how much more or less expensive an alternative is compared to that. Ash Way Option C sounds really good. Swift, TOD, 1.5 miles from a concentration of people, adjacent to both north and south 164th: that covers most of my goals. ST really needs to think more about the concept of transit as different from freeways. The P&R isn’t for cars coming from I-5; it’s for cars from the neighborhoods west and east of the station. The Northgate survey showed that 3/4 of the cars came from Licton Springs to Maple Leave and beyond, not from Shoreline or Snohomish County as one might have expected. People around Mill Creek and Martha Lake don’t need a P&R at the freeway, they need a P&R where the trunk transit is. Park n Rides were located at freeways because express buses have to use the freeway. That was the same reason for Convention Place Station: it was the entrance to the I-5 express lanes. But grade-separated rail doesn’t need that, and it’s surrounding area doesn’t need it either. So it’s better if the line is closer to a pedestrian concentration, and either foregoes a P&R or has a small one for just the perpendicular area. If necessary there should be two stations as in Bellevue: one in the center for pedestrians and bus transfers, and another in the periphery for the P&R. Don’t put the two together as downtown Lynnwood is doing. Now if Ash Way were the peripheral station, that would be one thing, but Ash Way is further out and mostly a different rider market than Lynnwood. As for Mariner, i don’t know much about the area or its potential. I know there’s a shopping center a couple blocks from the current P&R I’ve been to, so that’s something for a potential urban village. All the options seem to require one to choose between either Swift or TOD rather than both, so it’s hard to say which is more important. I guess I’d lean toward Swift, because we’ve already talked about how Swift Orange won’t connect to Lynnwood Link and how that forces a three-seat ride between Link/the 512 and the Mukilteo ferry/Boeing/Future of Flight, or Link/512 to the Canyon Park area. ” … and have better connectivity from downtown Mill Creek, which would only be 1.5 miles away.” And Ash Way would be 1.5 miles + 1500 feet away. Let’s not make it sound like Option C is that much closer to Mill Creek than the other options. And can anyone find an example anywhere in the US where gov’t has eminent domained a Walmart to build bus bays? – Having a station east of I-5 is enticing, since the stations just to the north and south are west if I-5. – The immediate area looks flatter so it will be more walkable — TOD or not. I’m just judging from aerials online so I can’t really tell. I also wonder if there is a way to repurpose the existing park-and-ride freeway access overpass to be a great pedestrian connection across the freeway. The ramps won’t really be needed after Link opens. I could see using the existing southbound I-5 overpass and part of the HOV ramps south of the overpass (maybe a diagonal pedestrian bridge crossing the freeway lanes) to get pedestrians to 164th St SW for sites B or C.
The “east half” (NB I-5) side of the overpass still needs to be built, but could easily connect to the Interurban Trail. I believe there’s mention of that in the detailed ST3 proposal. Nothing about 164th is pedestrian or bike friendly. I also like the Martha Lake location because it wouldn’t displace any existing Ash Way parking, which means less pressure to build an expensive garage – even a smaller garage is a win, as the savings could be put into safer ped/bike crossing(s) of I-5, which are sparse in the area. Who would use the P&R when the express buses are eliminated, if the train doesn’t stop there? Seem to remember places where the corporations that owned Mall-grade stores shut them down because they weren’t making any money. And recently seen National Security used force Government to buy fossil fuel, despite the fact that places like Texas have been going Renewable in order to keep their own budgets from collapsing. But critically classified DARPA (look it up) experiment on what happens when things in action are encouraged to take their course. The word “Inertia” doesn’t always mean Seattle government. Environmentalists crank up insistence that Climate Change (definition of Fake News) is going to cause major global warming. Leading present over- assisted renter of 1600 Pennsylvania to order every particulate-creator throttle-down just to show France we mean business. Since so many fact- bound civil servants are already storming fences in Hungary to get asylum Syria, won’t be anybody left who dares to point out that hairpieces that look like a county in Northern California are even more combustible. First sunny day in Monterrey, USA definitely will become more secure. Now Back to the Bays. 1. There’s only one way to travel those 1500 feet, which is 164th. 2. That crossing is a freeway interchange, including uncontrolled ramp crossings. The safety issues there are not as bad as they used to be (at some point recently they got rid of the exceptionally dangerous uncontrolled double-land ramp crossings), but you’re still at the mercy of accelerating drivers. 3. Any further pedestrian improvements along 164th must be approved by WSDOT, are limited by WSDOT’s consideration of car capacity, and tend to be expensive projects because design and infrastructure has to account for heavy car traffic. 4. Creating a new way to travel those 1500 feet is much more expensive than in most other places because of the freeway — in this location it would probably require a bridge spanning the freeway, and those are pretty expensive! Now, as for the 1.5 miles: the main way you’d travel the 1.5 miles from Mill Creek up to the station area is 164th, and considerations of grade and traffic make those fairly unpleasant miles anyway. The magnitude of the unpleasantness is not nearly that of the freeway crossing, but it’s enough to deter a lot of people. 1.5 miles is a fairly long way to walk but a reasonable bike ride; unfortunately the conditions on 164th would deter most people from riding. As it is, there really isn’t much in the way of alternate routes; due to the terrain and some short-sighted development decisions the local street network connectivity is very poor. But the grades here are merely steep, not exceptional, and short-sighted decisions involving hill-side residential developments are cheaper to alter than those involving freeways. Having made the trip up from Mill Creek to Ash Way P&R, I’ll take you at your word on the distances, that the 1500 feet you cite is about one-fifth the distance of the 1.5 miles. That sounds about right. And you can take me at my word that most of the climbing is in the 1.5-mile section. All that is easy to check online anyway. But when I think about making that trip, it’s the 1500 feet that loom large in my mind. This, by the way, is another 1.5-mile walk I’ve made many times to regional transit (beginning point fuzzed for privacy). It’s such a nice walk I’ll turn down a ride to the station unless I’m in an unusual rush. This isn’t part of any rhetorical point towards Sam. It’s just something that is: that was once a place where a lot more people routinely got around car-free, and though the infrastructure for that has declined along with the habit, there’s a lot that still remains, stuff that we’ll have to build up mostly from scratch in Seattle’s suburbia. Actually, I have walked it. It wasn’t pleasant (crossing the freeway never is) but it was better than most trips across (or under) a freeway I remember. The Aurora Bridge and Ballard Bridge are much worse. Northgate Way (under the freeway) is much worse. 130th (at least the south side) is much worse. I was on the north side of the road, and there was only one spot that wasn’t regulated by a traffic light. But even then it was an entrance to the freeway with only one lane, and great visibility. You simply waited for traffic, and crossed (and if someone waited for you, nobody else could pass and around them and run over you). The biggest problem is that it is just long — it is just a very wide pathway. My guess is Mountlake Terrace, for example, is terrible. But that kind of misses the point. What Sam is getting at is that being on the other side doesn’t put you close to anything. There is very little there. You are still a long ways from Mill Creek, and just about everyone headed there will take a bus. While a pleasant walk from one side to the other would be great, there simply aren’t that many people doing that, just as there aren’t that many people who walk across the Aurora Bridge. Now the Ballard Bridge, that is another story (and a big problem for pedestrian mobility). Don’t talk to me about walksheds. It’s a theory that only exists in urban planning textbooks. You Americans react to being asked to walk a block or two like you’ve just been asked to walk the entire Appalachian Trail. It’s why you people want the CCC. Because you don’t walk from from 3rd ave to 1st ave. So please, stop with the walkshed talk. Americans hate walking. Do any of these sites create platform locations that require significantly more or less stair steps to reach a platform? Siting is a three-dimensional choice — not just a plot on a map. Think about how TIBS is so high, or Downtown Bellevue will have more reachable, low-profile stations as to why this is important. I’d imagine the platforms would be elevated around 50-60 feet above ground like the other, more conventional stations being built for Lynnwood and Federal Way Link. Even for the double-crossing Ash Way Option C, there’s plenty of room to gain/lose elevation for proper clearance of I-5. There are lessons to be learned from the current alynnwood Link planned stations. Shoreline North/ 185th is pretty good! Shoreline a South/ 145th is pretty horrible! I hope the freeway interchange operations don’t force ST to ever have a station laid out like 145th again. The further from a freeway ramp, the less likely that will happen. In contrast, the 185th station entrance is right above the platform with no mezzanine hassle. It’s almost ideal! This gets back to the reason Northgate and 145th Stations are where they are. In the 1980s and 1990s Metro put Northgate Transit Center and 145th P&R there because of the adjacent freeway entrances. Never mind that it’s a longer walk to Northgate Mall, Northgate North and a Northgate Way east-west bus, and the closest 145th concentrations (Bitter Lake, 15th NE, 30th NE). Also in the 1990s ST drew the long-range plan and put Link stations in the same place, because existing P&Rs seemed like a great place for Link stations because they were replacing the previous express buses, and if they’re good for one they must be good for the other, right? And because the land is already publicly owned so there’s no acquisition cost. Fast forward to the late 2000s and you have ST2 and the Lynnwood Link Alternatives Analysis. The representative alignment in the ballot measure defaults to the previous decisions in the LRP. 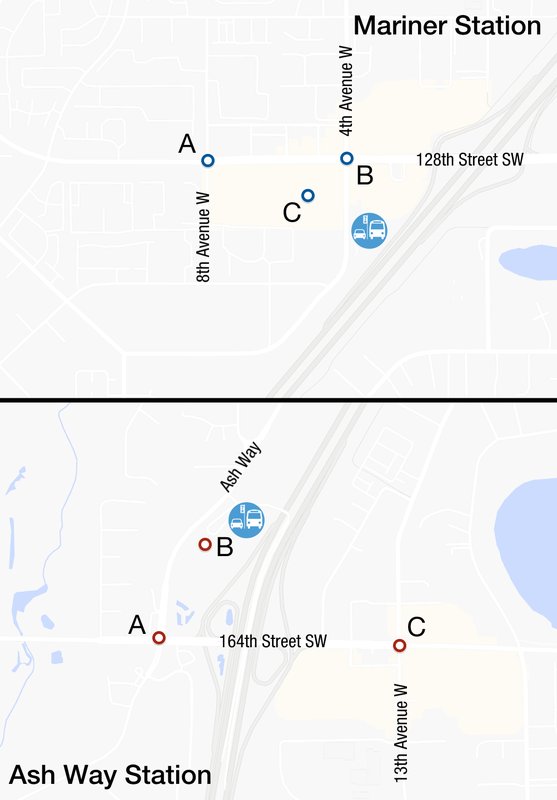 In the Alternatives Analysis there’s substantial public support for an Aurora alternative, and for moving 145th Station north or south to 155th or 130th or adding a 130th station. These would not have gotten as much public support in the 1990s because there was less awareness of non-freeway alternatives and the opposition onslaught would have been stronger. So the non-freeway-exit alternatives got a lot of public debate but it wasn’t enough to move ST.
Fast forward again to now, and there’s a little more openness to consider non-freeway alternatives for 164th and 128th. Especially, even the county is considering them. ST listens to counties first, cities second, and the public third. So it really makes a difference that they have Snohomish County’s tentative support, and presumably Lynnwood’s and Everett’s. So they may have more of a chance this time. But we’ll have to see whether it’s enough to overcome the inertia and opposition. But it’s a good sign that the politicians and public are evolving in the right direction. And yet it puts Seattle in the “first is worst” dilemma. Rainier Valley got surface because that was the 1980s default, but then every other neighborhood demanded a tunnel or elevated and got it. If Rainier Valley had been in a later phase it would have gotten a tunnel, trench, or elevated, and some other segment would have been worst. Unlucky Rainier Valley! And now Northgate and 145th are worse off than Lynnwood, Everett, Redmond, and Fife might be. The net result is that the densest inner places with the highest potential for ridership and transit mode share get the least effective stations. Except for U-District and Capitol Hill which are exceptions. It should be the opposite: the most ineffectively-located stations should be the outer ones where most people will drive to them anyway and thus won’t care where they are. Good thing Ballard-LQA-SLU-West Seattle are last in line then, eh? In Ballard and SODO the main issue is that the Port is a Very Important Organization. So should we order it “county, city, port, and public’ or “county, port, city, and public”? The plethora of 14th Avenue options and the lack of any other options from the Stakeholders Group and Electeds Group depress me. But overall I think my evolution argument stands; it’s just that other factors are interfering in Ballard. What you’re not hearing is “no trains near houses” or “no trains near existing retail businesses” like you heard in Des Moines and Surrey Downs. People generally want a train station near them. The Port is a large employer like Boeing or Microsoft, so it’s a different situation than strip-mall retailers. How about locating the station within the park and ride’s current footprint, but adding a pedestrian bridge over I5, connecting it to Mill Creek. The 164th St. crossing is too dangerous to use on foot, not to mention being out of the way. It would be nice if people living next to the station could shop at Walmart without getting run over. I’ve crossed at 164th. It’s fine. Not pleasant, by any means, but quite safe. Crossing the Ballard Bridge (which I’ve also done a few times) is much, much worse. Which is not to say that a pedestrian bridge wouldn’t be great. But my guess is it would be expensive, and used by very few. It is quite a ways to the apartments over there. Folks who stop at Walmart typically, if not exclusively drive. Hard for me to see a pedestrian bridge being worth it. Actually, if you map out the distances, the stuff east of I-5 isn’t that far – it just seems far because the current design inflates the distance by making you head south and back north again, and also a bit west and back east again (because I-5 is running NE-SW, while 164th is due east/west) – all the while, making you feel like a second-class citizen every inch of the way. For bikes, it’s even worse, because the sidewalk does not allow much room, if you ever need to pass a pedestrian (or another bike heading the opposite way). Which is doubly a shame, since most of the useful destinations are far enough apart that you’d want a bike to get to. We also have the Interurban trail so close, yet so far away. I get your argument, that everybody drives, therefore basic pedestrian infrastructure is not worth the bother – but you have to at least try, or there’s no hope of it every changing it. Obviously, a bridge is not sufficient, in and of itself, but it’s at least a step in the right direction. It is still a long ways. From Ash Way to Motor Place is over 1500 feet. It is a long ways because of all the ramps. You could create a shorter bridge from the parking lot (close to the freeway) over to the other side, but that is still about 800 feet and you still need to walk to the station. Either you put the station close to 164th and Ash Way, or all the bus riders have to walk farther. Assuming it is at Ash Way and 164th means that it is about a ten minute walk to the first actual location (the Arco — https://goo.gl/maps/hiWDzhEMhr32). There is also nothing over there. Sure, they could build an apartment or two, but there won’t be thousands of people within a ten minute walk. There would only be a handful, with (at best) a few more that would be fifteen to twenty minutes away. The situation is different with Northgate. The Northgate pedestrian bridge will connect to a college campus, which requires a detour (for several buses) to serve now. So it makes for a better bus network, while providing a decent connection to a major destination. The community is just a lot larger, as well. There are way more people, and way more destinations on both sides. You are right about the bike situation. It wasn’t a terrible walk (although I will likely never do it again) but it would be a terrible bike ride. But that is common (in the city and in the suburbs) and 164th itself is really bad. They could add a new bridge over the freeway and it would still be bad. In general there are very few decent routes in the area. The Interurban Trail is an exception. I think it would be great if they added another crossing, similar to the one at 124th. But I wouldn’t worry if it was a little ways up from 164th (just as the other crossing is a little ways up from 128th). Around 160th (where it restarts — https://goo.gl/maps/vfgccfFhivm) looks good to me. But you would need a bike path on the other side. That is the problem in general, there just aren’t enough bike paths in the area. Another bridge there would be great, but they probably have bigger fish to fry in terms of bike infrastructure. Even if there was a good bike/pedestrian bridge, it would mostly be used by bikers, and not lead to that many transit riders. The vast majority of riders will arrive by car or by bus to the station. If they go with Option B, a ped crossing near 160th is super logical, both to connect to the interurban and to provide an alternative to the freeway over-crossing. For option A, they could built a ped bridge that is right at 164 but is grade-separated from the on-ramps, similar to what cities have built across I90 in 17th Ave in Issaquah or 150th in Bellevue. Does anyone else think that I-5 bus access will be non-existent for these stations? Ash Way does not have connections from the north HOV lanes. That means that a bus trip to Bellevue, for example, involves a lot of time on busy streets with traffic lights. Mariner doesn’t have any HOV lane access (either direction). That is I why I think that whatever express buses exist will go to Lynnwood, which has good bi-directional HOV access (and is more of a destination anyway). Anyone else feel differently (and can imagine something else)? The open house makes zero mention of I5 bus access, so I’d imagine none. Both stations will (hopefully have good local bus access via a SWIFT connection, but for express bus service you’ll have to take Link to transfer to either Lynnwood or Everett. And I don’t really see a need for express bus service. Any express trip north & south on I5 will be served by Link by the time these stations open, and for East King you just travel to Lynnwood, which isn’t out of the way given the need to head south to catch 405. Keeping Lynnwood as the key Link-405 bus node seems like the right choice. Any trip pair where Link isn’t “on the way” is probably best served by CT buses that don’t get on I5, such as the new SWIFT lines. I’m just asking if anyone can think of something — some potential reason why they would run a bus on I-5 to either stop. I can’t. The train, while slow to Everett, takes a jog to the west. To the east there is very little, and almost all access is via the two streets that have stations (164th and 128th). If you are running an express (from, say, Marysville) then I think you stop in Everett or Lynnwood (or both). I really don’t see any point in stopping between there, but I just want to make sure I didn’t miss anything. The 532 runs from Bellevue to Everett with a stop at Ash Way. I would expect it to continue doing that. I don’t know if it’s able to use the existing bus ramp coming from 405, or if it has to use the regular exit because there’s not enough time to get over all those lanes. Good point, asdf2 (that was what I was getting at). I could see three possibilities. They could keep it as is, since Ash Way is the most popular stop on that route (outside of Bellevue). They could just get rid of it, and ask everyone to transfer in Lynnwood, or they could make that an express which skips Ash Way. That would save a lot of time (since Ash Way takes a lot longer to serve than South Everett). But even if they keep it serving Ash Way, it doesn’t make any difference. hat bus can’t use the HOV ramps, which means it will run on Ash Way and 164th to get to and from the freeway. This is different than buses like the 511, which only access the park and ride via the HOV lane. I think buses like that will go away as soon as Link gets there, which means the HOV ramps become irrelevant. At best I could see them being used one direction, like the 512, for an express (but I still think that is unlikely). That means that bus access — from every direction — will be via Ash Way or 164th, making Option A the best stop. Not objecting or affirming, Ross. But for the couple of years I used Ash Way at least a couple days a week, couldn’t understand what made that missing ramp such a big deal. Wherever Link goes, or doesn’t what’s the harm in an extra bus ramp? Really doubt that every single I-5 route will go away when Link opens. I think I-5 will still have express routes, I just think they will serve Lynnwood. It is pretty silly to run buses from the south to Ash Way or Mariner, since neither is much of a destination and Link serves them well. Link will run right next to the freeway and have very few stops between there and Lynnwood. That means these stations could have potential from the north (as bus terminus stations) except they are harder to access than Lynnwood. Unless Ash Way builds ramps to the north (which seems doubtful) it won’t be worth it. For Mariner, option A looks like the best choice, by far. Both of the other options are way too close to the freeway. Option C is especially bad, as it is off the crossing street, putting it well outside the range of all but the heartiest walkers to the east (https://goo.gl/maps/8ycdrFVnGc32) and making every bus transfer tedious. Option A is a farther walk from the park and ride, but that seems like an easy problem to solve (they could basically buy the Safeway parking lot, and shuffle things around). This seems like the direction they are moving anyway (easier turn, etc.) which is a good thing. Ash Way is a much tougher situation. Yes, option C is probably the best option for the system. But now you are telling people on Ash Way that they no longer have a convenient way to get to Lynnwood, let alone Seattle. You run into the implicit promise situation that exists within Seattle (in West Seattle and Ballard*). I think you are better off just going with A. No, it isn’t great, but at least it works well with Swift, and works well for Ash Way. There are a lot of people who live between 128th and 164th (a distance of roughly 2.5 miles) who won’t be walking to either station, no matter where you put it. They will hop on a bus that goes along Ash Way/4th, thus connecting the stations. While 13th is better from a potential pedestrian standpoint (farther away from the freeway, no swamp) it is not very good from a bus standpoint (it has east-west connections and that is it). Ash Way has fifteen minutes service now which is extraordinary for Snohomish County. Focusing on the buses is a good compromise, and putting it on Ash Way and 164th makes the most sense. Just make sure it is easy to get to the platform from the north and it is about as good as you can do. * Going with option C for Ash Way is a little different than the proposed Seattle changes, in that they can argue that it would lead to the highest ridership. In Seattle, they have a very unusual case, in that folks are leaning towards a system that is substantially different than what they voted for, worse for riders, and more expensive. I believe that is known as the idiot’s trifecta. I can’t agree with your assessment of Ash Way’s Option C. While there are apartments on the narrow strip of Ash Way (which is still surrounded by the 1970s-style low-slung neighborhoods that shouldn’t be targeted for light rail service), they are served just fine by current and planned buses that can easily shuttle people to the east-side station site. The 164th & Ash Way intersection is a tight fit and surrounded by large slopes that go up to the interchange, down to the wetlands and artesian well (which is somewhat of a local watering hole–literally), but not much else. Building from scratch on the east side of I-5 would be much better long term for TOD and local bus riders, which is far more important in my view. I understand the desire for TOD. I love to see cranes and new homes being built. But I think it is more important for transit to serve as many people as possible, not to provide incentive for new construction. Yes, there is a swamp to the west of Ash Way, but there is a lake to the east of 13th/Meadow Road. To me it looks like a wash. Even after the rezone (which would have to extend well beyond the walking distance to the station) you would have roughly as many riders at each station. If they build the station at Ash Way, then Ash Way will add new apartments (to the bunch that exist already). If they build the station at 13th, then it will have the same. The buses would cross the freeway, and just as many would save time as lose time. To me the tipping point is the implicit promise made to people in the area. The station is literally called “Ash Way”, not “164th”. Those building are going up with the idea that folks there will have easy access to Lynnwood and Seattle. They will have that, for years. Today it is decent, in a few years it will be great. But then, as part of Everett Link, you would be taking that away, all to spur development that you hope happens. That just seems wrong. Gasp! You don’t think someone would argue that the station sites away from the roadway names are “not consistent with ST3”, do you (cough … “Midtown”)? I agree. I live not too far from this area of unincorporated SnoCo and pass thru the corridor by automibile pretty frequently. The station imho should be as close to 164th and Ash Way as possible. The surrounding neighborhood has already been designated part of the transit pedestrian village on the latest FLU map (per the county’s last comp plan update). While there may be greater SPACE for potential TOD on the eastern side of I5 (Martha Lake), to date I believe there has been far greater residential densification and infill on the western side. FWIW. Thank you for the photo that accompanied this post. I think there are a number of commenters on this blog who still think that this area of SW SnoCo is nothing but suburban-style cul-de-sacs, which truly is an outdated notion. You’ve noticed that too. I put it down to reorganizing the website and not putting enough priority on putting forwarding instructions. There’s one document I’d really like to find again, a list of potential long-term features. One of the items was 24-hour service. It said it wasn’t justified now but it could be in the future as ridership and the population increase. One thing against Option C: adding two extra I-5 crossings doesn’t just increase cost and complexity initially, it also makes maintenance more difficult and expensive later on. That could cause more frequent track closures and disruptions. Yeah, I understand the appeal of Option C (Ash Way I’m assuming) but it just doesn’t seem worth it to me. Too politically difficult; worse for buses; not that much gained. Well, the purchase of property is related but not the same of where platforms are placed. The platforms could be in the I-5 median but the parking garage, bus loading area et al could be at one of these sites. The intent is merely to purchase property. This is why I asked for a general three-dimensional station layout schematic before really weighing in on what seems to be the best location. That would include geneal placement of bus connecting areas, drop-off/pick-up/Uber/Lyft areas and pedestrian/bicycle connections. Given the experience at Mountlake Terrace’s median bus station, I don’t think many here would want a median stop for light rail. It just doesn’t work for pedestrians from either side and is a really bad compromise. It’s worse than that, Sam. What SDOT says about missing and misdirected money is true. So only way to make it up is for First Avenue to have curb parking Jackson to Virginia. With preference to cars not later than 1952 vintage, and free parking for authentic rust. And streetcar tracks skillfully created to look freshly paved over to show that reason we fought WWII was to have cars. While all the while, ST adopted red and green livery, picked up whole generation of Melbourne cars and everything else built by no longer needed tank and battleship factories, set their speed limit to 90 everywhere they saw a cow and sides streetcar spurs to Edmonds. OK, cue the sailor and the nurse, swing band to “One O’ Clock Jump! and Roll ‘Em! For Ash Way, I wonder if the small neighborhood to the west along 22nd Ave W is considered part of the TOD envelope? That seems like a good opportunity to upzone similar to what Shoreline has done for the single family houses immediately next I5. I would think so. I think what makes the most sense is if they put the station close to 164th and Ash Way, and then rezone that area. It is not a huge area (which is why folks want to put the station on the other side) but it is something, and adds to the existing development on Ash Way itself. There is also land to the south of 164th that would probably be developed in the same way. Right now there is a storage place on one side, and a Chevron, etc. on the other. You move a little farther down and there is a church and some homes. I think the only wetland area is to the west (Swamp Creek). I also wonder about that little bit of green belt just south of the park and ride. I don’t think it is wetlands. Even if it is, I think it would make sense as a pedestrian path from the parking lot to a new station. If it is not wetlands, then it could be converted to apartments and a walking path. That area has already been upzoned in the county’s last comp plan update, which I think was in 2015. The FLU map indicates that the neighborhood you’ve referenced is included in the transit pedestrian village designation. an odd set of choices. ST is placing Link alignments in freeway envelopes. Link stations have to on Link alignments. pedestrian centers are rarely, if ever, in freeway envelopes. freeways are to pedestrians as dams are to fish. Link should serve pedestrian centers; the best TOD is POD. for pedestrians, full interchanges are worse than half interchanges, as they have more traffic that slows local transit and is hostile to pedestrians (e.g., NE 145th Street). In Snohomish County’s case, I can’t think of any group that argued for a non I-5 alignment. Some transit fans wanted it on 99 between Ash Way and Everett, but I don’t recall anyone else supporting that. Orr, yes it has been decided. we will have a freeway alignment. the SR-99 Link that was studied was designed to fail as it deviated back to I-5 for Mountlake Terrace. a more reasonable network would have had Link on SR-99 and bus on I-5 between Northgate and Everett via Lynnwood and the Mountlake Terrace center station. Perhaps another center station could have been added at NE 185th Street. this two line option would use both Link and bus at what they are best at. ST wanted one spine. we have to find the lemonade recipe.